Amess Street, Birdsall Place, Canning Street, Curtain Street, Davids Lane, Davis Street, Drummond Lane, Drummond Street, Earl Street, Fenwick Street, Fletcher Lane, Henry Street, Herbert Street, Hughes Street, Lee Street, Lygon Street, Macpherson Street, Mary Street, Newry Street, Nicholson Street, Ogrady Street, Park Street, Pigdon Street, Princes Street, Rathdowne Street, Reserve Street, Richardson Street, Shakespeare Street, Station Street, Sutton Street. Land that was to become North Carlton and Princes Hill, developed from the 1850s as an outpost of Melbourne Town, with a blue stone quarry reserve, an associated penal station, and the Melbourne General Cemetery as the main attributes set among native woodland. North Carlton (66) was surveyed in 1869 (67) as an extension for Melbourne's residential suburbs. The new half-acre blocks extended as far as Fenwick St, continuing the north-south grid of Carlton, with 30 metre frontage allotments served by generous 20 and 30 metre wide government roads. Reserves were set aside for public buildings and gardens. The renowned surveyor, Clement Hodgkinson, was the initiator of the 1869 North Carlton plan, as head of the Crown Lands and Survey Department (68). In 1876 the balance of North Carlton, north of Fenwick St (approximately 173 acres), was subdivided into small suburban lots typically with 15 metre frontages but each was provided with the Victorian-era amenity of rear service lanes, separating utilitarian household functions such as coal and other deliveries, nightsoil cartage and stabling, from the formal house facade. The 30m wide roads of Drummond, Rathdowne and Canning Streets were also continued north. The subdivision led to a distinctive form of housing development where closely spaced, sometimes richly decorated, houses are viewed over low formally arranged front gardens and fences, forming a continuous and distinctive residential Victorian-era streetscape. The extension of the Melbourne Building Act in 1872 to cover all of the Melbourne municipality ensured fire proof regulated construction and promoted a more homogenous built character for North Carlton (69). Public transport which was at first a horse-drawn omnibus service along Nicholson St to the city, stimulated development in Canning and Station Streets where standard pattern terrace housing predominated. With the population growth came the first government primary school (opened 1873, later replaced by the Lee St Primary School, 1878 (70), shops, shop rows, and corner hotels. The 1883 announcement of Rathdowne and Nicholson Sts as future cable tram routes meant an explosion of dense residential development of terrace housing in almost every street north to Park Street. In 1887-8 new cable tram and Inner Circle railway services gave this area perhaps the best access to public transport of any Victorian-era inner Melbourne suburb: rows of shops and residences were built along the tram routes. At the cable tram terminus in Nicholson St, adjoining the North Fitzroy Inner Circle railway station, a major shopping centre developed with grand shop rows, extending from Macpherson to Park Streets. 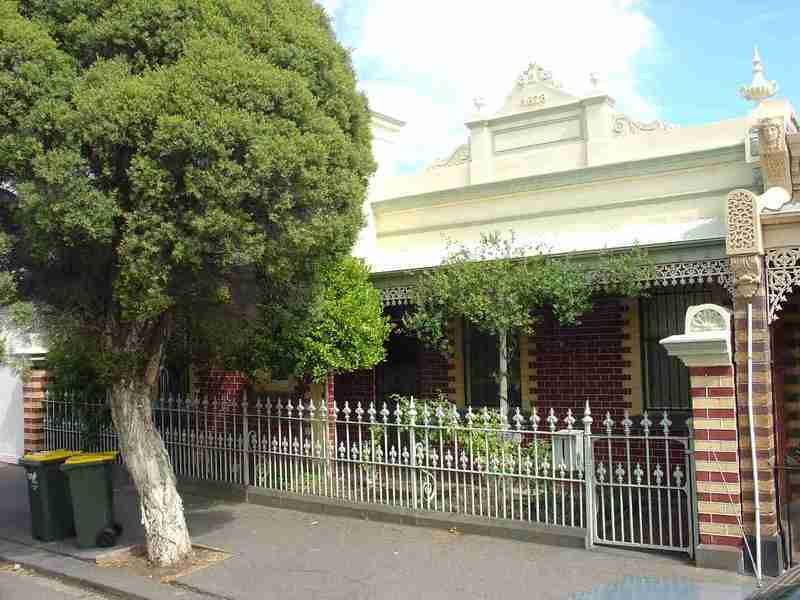 Then at the fringe of suburbia, northern sections of Canning and Drummond Sts were popular for larger, detached late Victorian houses that might have been served by private transport in the form of stabling. The Inner Circle passenger train link to the Melbourne (Princes Bridge) was completed in 1901 and operated until 1948 which explains the popularity of North Carlton in the Edwardian and Interwar eras. Significant public landscape in the area is both early, in the form of Curtain Square with its Victorian era residential perimeter, and residual, such as the linear park along the former Inner Circle railway in Park St. Significant street trees include median planting of Drummond St (mature poplars) and Canning St (mature palms alternating with poplars), more recent median planting of exotic trees along the line of the former cable tram route in Rathdowne Street(pin oaks), and the plane trees along the centre of Newry St. Small front gardens in the dominant terrace housing of the suburb make up most of the private landscape, including typically low and visually transparent iron and masonry fences, ornamental borders to garden beds, and paved paths and verandah floors: all often highly decorative. These living landscape elements along with the hard landscape of the street and its fittings, such as the stone paving and cast-iron street furniture, reinforce the strong sense of period in the suburb. Post 1900, infilling of North Carlton's vacant sites proceeded quickly and by about 1915 the suburb was virtually complete, with religious and educational buildings, and government services following each development surge. The suburb, once developed, was almost entirely residential with some factory-warehouse development after 1900 serving the commercial development in Nicholson and Rathdowne Streets. As a result North Carlton is a highly homogenous 19th and early 20th century residential suburb largely occupied by dense terrace development, set within a rigid rectilinear grid of north-south and east-west streets, served by rear lanes as an obligatory feature of polite suburban life of the era. Early and original rear outbuildings are an integral feature of the Victorian and Edwardian era character of North Carlton and are of particular historic significance where houses are on corner allotments where their outbuildings are exposed to public view. As a dense residential enclave close to Melbourne, employment centres, and the metropolitan public transport hub, North Carlton has also shared in the accommodation role of other inner suburbs, absorbing waves of immigration into aged but cheap housing stock and developing specific ethnic attributes, among the existing Victorian and Edwardian-era infrastructure, with each successive immigration wave. Traces of the Jewish (71), Greek, Italian (72), Lebanese and Turkish communities that settled in the suburb are still evident. Their community gathering places include those for the Serbian Orthodox, and Ukrainian Orthodox Church communities, the 1932-3 Kadimah (former Jewish centre), St. John the Baptist's Greek Orthodox Church, and the more recent Mosque in Drummond Street. Often they occupy the Victorian-era Christian buildings. Beyond the meeting places are the distinctive house renovations that transformed the Victorian-era Italianate into a form of post WW2 Italianate. Examples of these have been documented by the National Trust of Australia (Vic) (73): all of these places are important milestones in North Carlton's development as a reception centre for immigrants. The main development period evident in the heritage overlay is that of the Victorian and Edwardian-periods. There is also a contribution from well preserved inter-war buildings, documented examples of immigrant meeting places and house renovations, and individually significant places of all eras.
. Timber framed display windows and entry recesses.
. Public infrastructure, expressive of the Victorian and Edwardian-eras such as bluestone pitched road paving, crossings, stone kerbs, and channels, iron bollards and gas lamp bases, and asphalt paved footpaths.
. For its association with Melbourne's early history, as seen in the former Collingwood Stockade quarry reserve sites (such as Curtain Square), and the Penal Station (later the Lee St. Primary School site).
. For the individually significant buildings from all eras and well preserved building examples, from pre World War Two, that express a rich assembly of architectural design within the characteristics of Victorian and Federation-era residential styles, some factories and warehouses, Moderne style flats, and large inter-war villas. 68 From 1860, Clement Hodgkinson was appointed the administrative head of the Lands Department, and displayed a strong interest in the planning and development of Melbourne's suburbs and parks. 1861- 1874 Clement Hodgkinson was the Victorian Assistant- Commissioner of Crown Lands and Survey.